The following is an excerpt from my novel THE DEPTHS OF EVIL, published by Double Dragon. weeds, rickety porches, old, faded curtains hanging from rods on dark, dusty windows beyond which they could see nothing. They had gone into the gas station, looked around, had found nothing of interest. Now they were searching the old general store, full of dry goods in old, crumbling boxes and rusting tins and cans. There were old coins and a few bills in the till – quarters, dimes, nickels, pennies, most from the 1940s, 1950,1951.
panels, running boards, massive fenders. Definitely old school. All sat on flattened tires, had broken windows, had been claimed by the jungle, as it were – weeds grew in them, out of them, around them. It had been fifty years, after all. “What’s odd about the cars?” Sheila asked, exasperation evident in her voice. Douglas was in one of his thoughtful moods when he mumbled most of his words and did not seem to be aware of the presence of others. He looked up sharply, roused by her tone. “Some of them didn’t seem that old,” he said flatly. John joined them, looked at Douglas expectantly. John frowned as the implications sank in. The dust in the place was oppressive, the air close and hot, all but suffocating. Sheila brushed away strands of orange hair from her forehead. “So what does that mean?” she asked at last, as if her mind was not willing to figure it out. “It means other people came here, not so long ago ...” Douglas said carefully. Damn, but he was indirect. “What bothers you?” John asked impatiently. vines. It seemed menacing, somehow, that car – just sitting there. Full of secrets. What would they discover if they opened the door, looked through the glove compartment, under the seats? The inside of such a car would be the perfect place for a writhing nest of snakes, like rattlers. Why would you walk away from a car like that in the first place? Why not use it to drive away, drive to safety? Why leave it behind, abandon it to the elements? The land here is evil. They agreed with her – reluctantly. John glanced around, betraying his anxiety. The stillness, the quiet – it was unnerving. It was as though they had dropped off the map completely. It was a silence that one felt deep in one’s bones, a silence that screamed to be heard. There should have been the normal background chatter, normal background noises – the chirping of birds, the roar of a semi, the squeal of a motorbike, even just the distant rumbling of a tractor. There should have been the sounds of wood creaking, of trees moving, of fish jumping and splashing in the lake. The sounds of life. Yet there was nothing. Only the sound of their breathing, the sound of their shoes against the gravel and grass underfoot, the sound of the fabric of their shirts and pants as they moved. You could go mad, John thought, in such silence. With nothing more than this silence. It would break you, eventually. It would crush you. Overhead the buzzards continued to circle their eventual prey, whatever unfortunate animal that might be. John watched them. Did he hear their distant cries carried on the wind, or did he only imagine them? In horror movies, he thought, there was always a moment when things start to go wrong – the center does not hold and things fall apart. Was this that moment? Should they pack up and leave, like sensible people would? “Let’s take the canoe and go out on the lake,” Sheila suggested brightly. Bringing the canoe had been her idea. They were going to need shots of the famous Edward’s Lake – both the town and the body of water – after all. “Maybe I can get some good shots from out there,” she said, nodding her head in the direction of the dark waters. “Yeah,” Douglas said. Then said no more. John stared at the dark waters, gripped by uneasiness. The lake seemed dangerous, somehow. There were so many sheltered coves and inlets, so many weeping willows perched on its overgrown shores. Anything could be in that lake, he thought. He thought of other lakes, of Michigan winters, of childhood, skating on cool, smooth ice with his brothers and sisters. He thought of the possibility that Joey had drowned in the river, his body washed downstream, never to be found. That it might still be lying somewhere. Bloated. Chewed by fishes, crabs. Dragged off into the woods by a bear. Now nothing but bones and a skull. He had a thing about lakes. About water. Watery depths. Darkness. Things down there in the darkness. Clinging things. Things that bite, rip, tear. parked. Tied across the top was a canoe that belonged to Douglas. Douglas had a thing about water, too: he loved it. They undid the ropes, got the canoe down – it was surprisingly light. equipment,” Douglas said with a smile. John and Douglas carried the canoe on their heads down to the waterfront, less than a hundred yards from the village. An old, rotted dock stood there, many of the boards missing. It marched away into the dark water, ending abruptly in a collapse of boards and wooden pilings. The water was clear but murky. Lily pads clustered around the shore, spreading out into the lake, making it impossible to see how deep the water was. They put the canoe in the water. Sheila jumped in, cameras around her neck, walking on sure feet. She took up position in the very front. “Now you,” Douglas said to John, pointing at the canoe. Trying hard not to betray his misgivings, John got in the canoe, was immediately horrified at how easily it swayed this way and that. He sat in the middle, in the very center, and sat very still, gripping the sides with trembling hands. Douglas got in gracefully. He paddled first on one side, then on the other, taking them straight out into the middle of the lake. No need to worry about that, John thought. Don’t puke, would be more to the point. He stared at the sullen waters passing by on either side, wondered how deep the lake was and what was down there – then desperately tried to push such thoughts away. They were so close to it, he thought – so close to the water. He could reach out and touch it, if he wanted to. What he couldn’t do was see down into its dark, watery depths. The lake was not very big, the waters placid: Ten minutes of rowing would take them to the other side. It was clear of lily pads and the green slime of algae in the middle, but along its edges, it was positively choked as the lily pads and algae competed for space. Douglas took them to the right, following the outgrowth of lily pads and the green of the algae blooms. Cattails stood out among the lily pads. The banks of the lake were tangled with undergrowth, weeping willows and old tree roots. jumping from one lily pad to the next. No fish. No minnows. No water spiders. No mosquitoes. No cranes standing near the shore, searching for prey. It was a dead lake. Like everything else in Edward’s Lake, there was not a sign of life to be seen. A lake like this should be full of life. There should be birds on the shore. Frogs on the lily pads. Fish and minnows. Hunters and the hunted. Predators and prey. Why had Joey said that? What did it mean? The land here was the same as any other land. Right? There was nothing inherently evil about land. Yet something must have driven off all the animals, the way a jungle goes suddenly silent when a lion appears. But what could possibly drive off all the animals, right down to the mosquitoes and spiders and worms? Nothing natural could account for that. John and Douglas had to admit that they had not. “Sleuth is not a negative word,” Douglas protested. “Tracking down a killer? That’s not negative? Or slippery. Or a slight. Slick. Slow. Slither. “Sleep,” Douglas said. “That’s not negative. Douglas merely grinned, dipping the paddle into one side, then the other, propelling them forward through the turgid waters. They left a slowly-twirling trail through the green algae. “Can we go back now?” John asked. He was feeling decidedly faint and unwell. Perhaps it was the sun overhead, which was bright, hot, unpleasant. Or perhaps he’d had just about as much water as he could take for one day. He wanted to be back on the shore and the sooner the better. They approached a rocky outcropping on the far side of the lake. “Do you smell it?” Sheila asked, turning to look at them. John did. It was the smell of death. Of a dead animal. “Let’s see what it is,” Sheila suggested. John bit his lip and held his tongue. Let’s get the frickin' hell out of here, is what he wanted to say, but didn’t. The smell of death became heavier, undeniable. They drifted into an alcove, of sorts, formed by dark rock walls. The water continued straight into the rocks and there was an opening just high enough for them to pass under. “Shall we go inside?” Sheila asked, turning to look at them. “John?” Sheila prompted, wanting his approval. “Sure,” he said. He tried to smile. Douglas steered their small craft toward the opening. They ducked down and disappeared underneath the rocky outcropping. Inside they found a large cave. The smell of death was all but sickening here, and they quickly discovered the reason why: a pile a carcasses lay on the rock floor at the water’s edge. Deer, mostly, John thought, judging by all the antlers. But bear, too, and other animals no longer recognizable. The animals themselves had not been eaten, as such. They had been bitten all over their bodies. But dragged in here and bitten by what? camera lit up the scene in ghostly bursts. “Guys, I don’t think we’re alone,” Douglas said very quietly. Too quietly. John glanced over his shoulder at the tall, gangly man, who lifted his eyes very slowly toward the ceiling. looked like the eyes of children. When Sheila’s flash went off, he saw that they were indeed children, perhaps a dozen of them, perched on the rocks above. Douglas backed the canoe away very slowly. faces brought her up short. She looked at John. John looked up, almost imperceptibly, towards the children. She caught his meaning, raised her eyes casually. Quick as a flash, she brought her camera forward and started taking pictures. There was angry hissing above. Sheila pressed the shutter again and again, ignoring him. There was a weird screeching noise, the rustling of bare feet against rock. 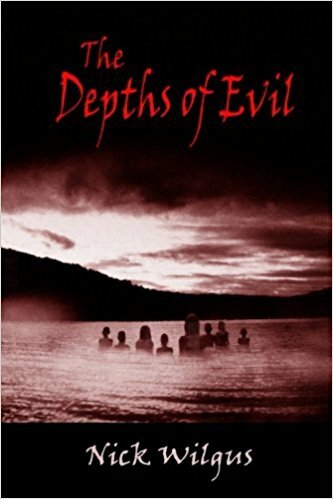 Click here to order your copy of THE DEPTHS OF EVIL, available in both paperback and ebook formats.